Photo by Asia Morris. Artist Yoskay Yamamoto working on his temporary wall on Ocean Boulevard. UPDATE | A few more updates regarding Pow! Wow! Long Beach (PWLB) 2017 have been announced today, including the schedule of events to take place between July 16 and 22, and an additional artist that has been added to the mix. Yoskay Yamamoto, who collaborated on a mural with artists Andrew Hem and Edwin Ushiro for last year’s PWLB at Steelhead Coffee, has already begun painting the temporary walls bordering City Hall and the Main Library along Ocean Boulevard. The project was commissioned by the City of Long Beach and has been deemed an honorary addition to this summer’s PWLB festivities. Yamamoto estimates it will take him about two more weeks to complete the mile-long mural, and welcomes all those curious to stop by and experience the process. The Pow! Wow! School of Music will also be conducting their own program, to feature student performances throughout the week. The Pow! Wow! pop-up shop at MADE by Millworks will celebrate its grand opening with music by POW! WOW! School of music, food and drinks. Exclusive Pow! Wow! Long Beach merchandise will be available for purchase throughout the entire week. MADE by Millworks is located at 240 Pine Avenue. Tickets are $5 and can be purchased online here or via the Pow! Wow! Long Beach App. The Art Theatre is located at 2025 East 4th Street. Popular street artist Tatiana Suarez will discuss her career with contributing writer for LA Times, LA Weekly and KCET, Sarah Bennett. MOLAA is located at 628 Alamitos Avenue. An all ages event presented by the Long Beach Convention and Visitors Bureau will host music, food, and more. Guests must RSVP via Pow! Wow! Long Beach here. The Cove is located at 300 East Ocean Boulevard. An all ages event at The Varden Hotel that will feature live art, DJs and refreshments. The Varden is located at 335 Pacific Avenue. For more information on Pow! Wow! Long Beach visit the website here. Photo by Asia Morris from Pow! Wow! Long Beach 2015. 6/23/17 at 5:12PM | If you’ve been keeping up with Pow! Wow! Long Beach, you’ll have noticed the slow leak of Instagram posts announcing the participating artists for this year. The full roster, now available on the website, is an eclectic array of local, national and international artists, all set to land in Long Beach come July 16 for the start of the festival. Arguably the week-long artistic adventure that is Pow! Wow! Long Beach may best be portrayed through the excitement of those that are newest to the scene. While street art veterans like Apexer and Mike Giant are surely looking forward to showing off their skills, there’s an excited nervousness perhaps felt more strongly by those looking to prove themselves this year. Not to mention, it’s exciting for the fans to show their support and root for these burgeoning creatives as they tackle their largest walls yet. Photo courtesy of Bodeck Hernandez of his mural-in-progress for the Cambodia Town Mural Project. Two of these “rookie” Pow! Wow! artists include city residents Bodeck Hernandez and Noelle Martinez, who are both ready to show off their hard work and talent on the international stage Pow! Wow! provides, right here in Long Beach. Born in the Philippines in 1986, Hernandez and his family migrated to Long Beach in 2001. His first large-scale outdoor mural is the one he’s currently working on in Cambodia Town for the Arts Council for Long Beach’s Cambodia Town Mural Project, so he’ll be starting his Pow! Wow! mural with the lessons from his first and latest mural in mind. Photo by Andrick Aviles. Noelle Martinez during Paint Phoenix 2016. 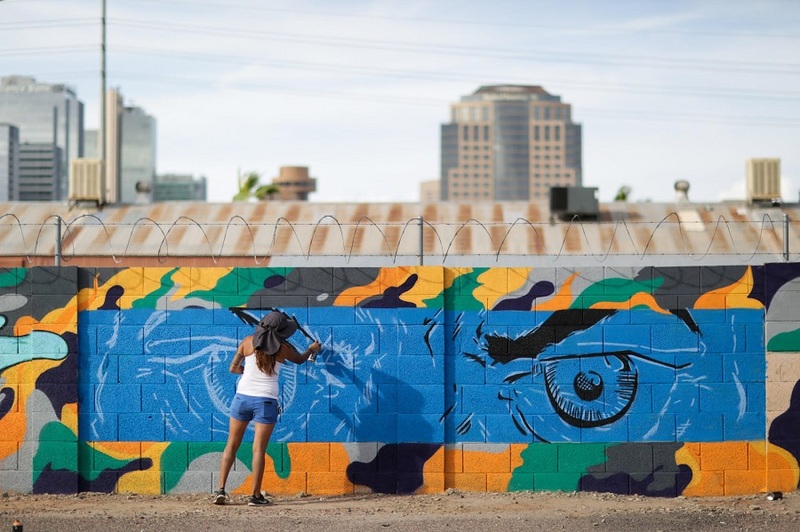 Raised in Phoenix, Arizona and a current Long Beach resident as of last year, artist Noelle Martinez will be painting her second large-scale mural, her first for Pow! Wow! Long Beach. Martinez is no stranger to the inner workings of the festival, having volunteered to help the artists of the very first Pow! Wow! Long Beach in 2015, worked as an intern for Pow! Wow! Hawaii and was hired on as a crew member for Pow! Wow! Long Beach 2016. One of the most prolific and hard working young artists out there, 27-year-old Martinez has assisted the likes of Aaron De La Cruz, FAFI, Benjie Escobar and more. She’s just at the start of her own career and is looking forward to having her own wall in July. For more information on each of the artists, check out the webpage here. Pow! Wow! Long Beach mural created in 2016. Photos by Asia Morris. 5/30/17 at 6:12PM | Pow! Wow! Long Beach will officially return for its third consecutive summer, it was announced today. Be prepared to experience another round of murals being painted Sunday, July 16 through Saturday, July 22 by some of the most talented street artists both local and, presumably, from around the world. 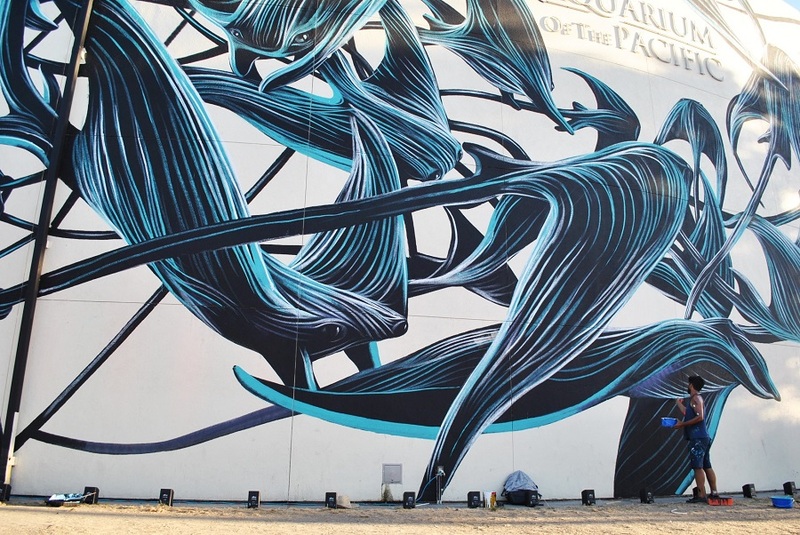 In 2015, the festival made its mark in Long Beach with murals painted by internationally and regionally acclaimed artists such as James Jean, the Low Bros, Tristan Eaton and Jeff Soto. While most of the art has been concentrated in Long Beach’s downtown area, with a few outliers last year, Pow! Wow! 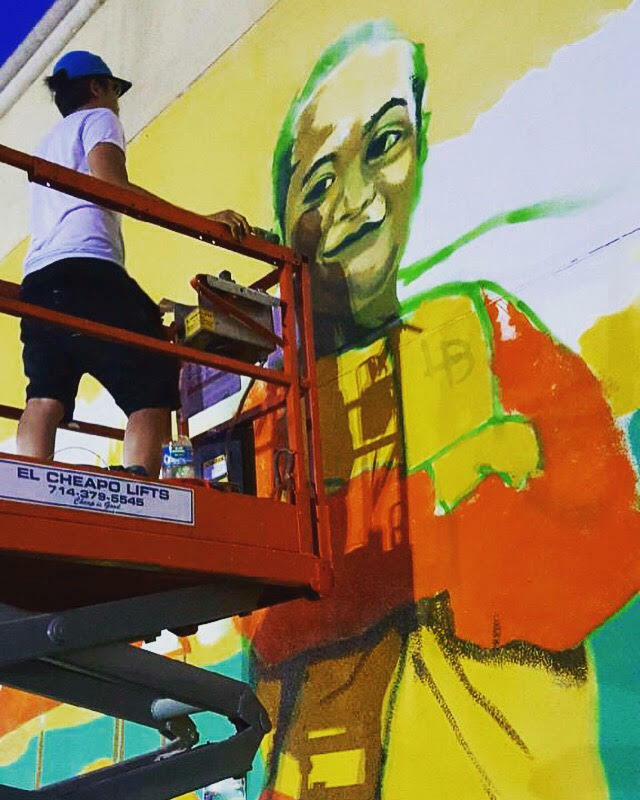 Long Beach 2017 will have murals in every district, Concepcion said. In its first year, Pow! Wow! Long Beach brought on one local artist, Jeff McMillan, and a slew of outside talent, while the summer of 2016 saw an increase in artists from Long Beach beautifying city walls. Alongside visual art, Pow! Wow! School of Music also brought talented youth musicians and mentors together to create and learn from each other, culminating in a performance at the end of the educational experience. Pow! Wow! Long Beach mural created in 2015. As Pow! Wow! Long Beach grew in popularity and sparked the interest of more residents, a community meeting was held before its second summer. In 2016, the festival brought even more international talent to the area from Portugal, Spain and France. As the new director of the Long Beach leg of the globally acclaimed street art festival, Concepcion said she’s not going to take her position lightly. Visit our tag “POW! WOW! Q&A Sessions” to find out more about the individual artists who have brought their unique perspectives and imagery to the city, both through Pow! Wow! Long Beach and the coinciding Long Beach Museum of Art exhibit series Vitality and Verve. For updates, visit Pow! Wow! Long Beach’s Instagram @powwowlongbeach.